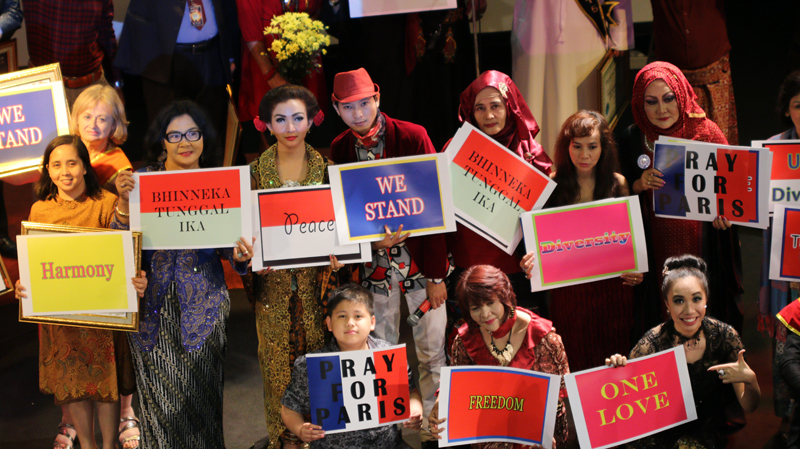 (11/16/15) During World Tolerance Day 2015, a group of filmmakers from around the world gathered together and surprisingly showed their condolences to what happen in Paris few days ago.This event started with Pray for Paris led by a woman of Faith Lily Wahid, who is also known as the sister of Gus Dur, the Indonesian 4th President who was well-known for his work for pluralism. The event ended with declaration for tolerance. This two things triggered after the shooting and bombing that happened in Paris that killed more than 100 people. This act was a proof of intolerance that’s happening to this world, said Lily Wahid. Natasha Dematra as an ambassador for tolerance said that Pray For Paris is a prayer for the recovery and the safety of people in Paris and all over the world from act of intolerance. Hope that this event will touch people’s heart and open the eyes of the world to appreciate differences and bring hope that there would be no killing and violence in the name of intolerance and religion. 1. Tolerance is the base of living together to create peace, and an absolute thing to create harmony in differences. 2. The terrible thing that just happened in Paris, Bangkok, Tolikara Papua, Singkil Aceh and lots of place in the world is the prove of there are a lot of blood that had to be shed because of intolerance and this could happen anywhere. 3. Every soul has the right to live without being judged, even though we have different tribe, race, religion, cultures, etc. 4. Intolerance is the source of all the blood shed and is our commin enemy. Tolerance is the solution to bring together people with deferent backgrounds to live in peace. 5. Bhinneka Tunggal Ika or Unity in Diversity is the culture of human kind. Let us appreciate each other and put ourself as a civilised nations with that principle as it's main base. 6. A world without tolerance is not a modern civilsed world. A world of tolerance promises us the bright future we’re going to have. With this we want to tell all nations, that even though we have differences, tolerance is a must and must become a main principal to make a safe world and a world of peace. 7. We beg all of you from around the world, to hold yourself from act of intolerance.